The UK delivers its statement on the Universal Periodic Review of Honduras, 8 May 2015. 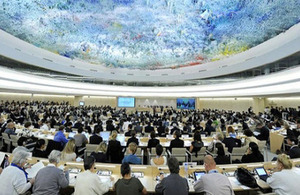 The UK commends Honduras for its engagement in the UPR and steps taken since the last review, particularly to amend the criminal code to make enforced disappearance and femicide specific offences, and bring the definitions of torture, discrimination and incitement to hatred in line with international standards. The UK recognises Honduras’ achievement in reducing homicide rates. However, we are concerned by the intention to use military police to tackle security as a medium to long term measure and encourage the strengthening of the civilian police instead. We welcome recent legislative changes, particularly congressional approval of the Law on the Protection of Human Rights Defenders, Journalists, Communicators and Justice Officials. However, we are concerned at continued high levels of impunity and that significant sectors of society experience difficulty in accessing justice. We recognise the Government’s willingness to engage with UN and Inter-American Commission on Human Rights (IACHR) special rapporteurs and working groups, but are concerned by reports of diminishing space for civil society organisations. We urge the Honduran Government to engage constructively with NGOs and human rights defenders, and to promote an environment in which human rights can be debated in an open and inclusive manner. Amend legislation to decriminalise defamation, slander and libel and convert them into matters regulated by civil law rights standards set by the UN and IACHR observations and recommendations. Ensure that human rights bodies such as the Public Prosecutor’s Office and the Judiciary have the necessary financial and human resources as well as human rights training to guarantee their independence and impartiality so that they can perform their work effectively.